This hot new collaboration was released on the 17 November 2017, and therefore is acting as my New Release for this backdated date. It's quite the team-up, one we all can't help but love, especially since Latin music is extremely popular right now. The song is dead catchy with ex-summer vibes displayed throughout; however, it feels like they've transformed the track into a eurodance anthem and it just feels like it's trying that little bit too hard; regardless it is fire! 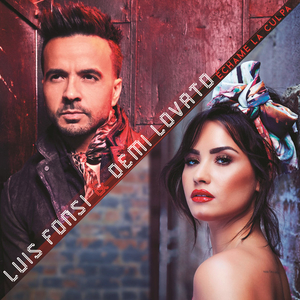 Watch Luis Fonsi and Demi Lovato come together in this fired-up dance music video which sees them perform together for the song "Échame La Culpa". Luis Fonsi, real name Luis López-Cepero, is from Puerto Rico and is best known for his worldwide hit "Despacito" which was a collaboration with Daddy Yankee, and was later remixed with vocals from Justin Bieber. It blew up all around the world, grabbing many number ones in various countries. It has certainly launched Luis Fonsi as an international artist, one we're all keeping our eyes on. He has been in music since the late 90's which is truly remarkable and shows that perseverance really does lead to international fame. In comparison, Demi Lovato has certainly not been in music for as long, but she is one of the rising female artists in the world, one we're all aware of and constantly listening to, so this duet was definitely the perfect collab. It just feels like it's been released a little too late, Latin music always brings the summer sunshine, but it's now winter, and this doesn't have the winter-feel to it. In English "Échame La Culpa" means "Put The Blame On Me". It was written by Luis Fonsi, Alejandro Rengifo, Mauricio Rengifo, and Andrés Torres. Directed by Carlos R. Perez, the music video has a lot of Latin vibes to it, working well with Spanglish song. Demi Lovato's clipped Spanish isn't so bad but after a few plays, you realise she's not fluent in Spanish at all - which we already knew. This is more of a performance piece more than anything. Luis Fonsi and Demi Lovato start off with intercut scenes, she's in a bedroom, lying on a bed, whilst he's in an alleyway, walking down some stairs - he looks hot in those trousers whilst she looks hot throughout the entire visual. They talk on the phone, saying "Hey", before hitting the club where they dance the night away. Their performance pieces are on fire, and you can expect an entertaining show with both these amazing artists on stage at a gig. Luis Fonsi brings it a little more than what Demi Lovato does, and he manages to get more video time. The elevator sure is a main visual that we presume takes us to the club, although we're not sure how Demi Lovato gets there. Overall this music video would've worked a lot better if there had been a narrative or we had at least seen how Demi Lovato went from the bedroom to the club. She seems awkward in her dancing at the venue whilst everyone else bats out brilliant choreography. She does bring it to the performance piece, though. As for Luis Fonsi, he practically saves the whole video from completely falling apart.